Frightful Fish - Halloween Game Idea! Halloween Game Idea – Frightful Fish Game! This game can also be played at a daytime event! 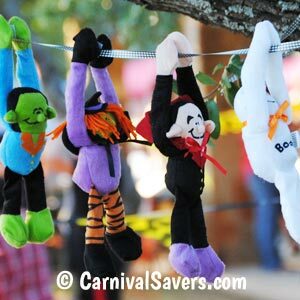 Hang your Halloween Prizes for All to SEE! Carnival Prizes - consolation and top carnival prizes! This game is mimicked after the very popular Fish Bowl Carnival Game with a Halloween twist! If you go to a professional carnival - this is one of the games you are sure to see! We have made this "fish friendly" and recommend only using pretend fish for the fish bowls! 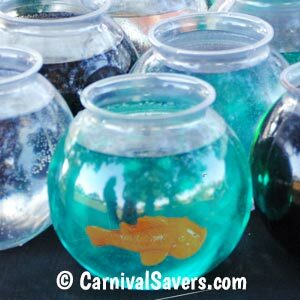 Before the carnival, fill the fish bowls with water to the neck of the bowl. Next choose about 8 colorful squirt fish to add to just 12 (or half) of the 24 bowls. (see image above.) In order for fish to sink to the bottom, immerse them into the water and squeeze them to release the air and replace with water - your squirt fish should sit on the bottom for your game. Players are given 3 balls to try their chance at getting a ball into a fishbowl with a squirt fish in the bottom. If they get their ball into an empty fish bowl or no fish bowl at all, they receive a consolation prize. Like all carnival games, we recommend you set this one up and test it out. In our tests, giving players 3 chances, they have about a 1 in 12 - 15 chance of getting a ball into a fishbowl with a fish or light when standing about 3 - 5 feet from the game. Older players did not do much better than younger players - this Halloween game looks much easier than it is!! Note: The plastic fish bowls can be pricey so we came up with a similar carnival game that uses plastic cups. 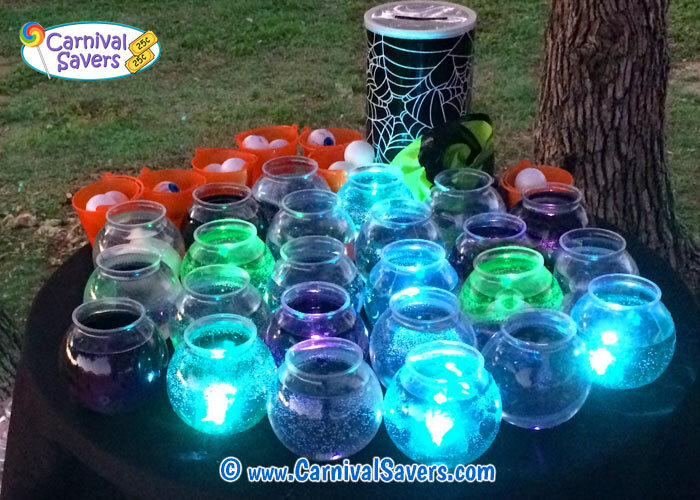 We show it for our traditional Fishbowl Carnival Game - but you can add the food coloring, fish and underwater lights to to 9 ounce clear plastic cups and and have a Halloween look to the Fish Cup Carnival Game idea from your friends at Carnival Savers! Looking for a teen carnival game idea - try the Shark Tank Carnival Game which is very similar to this game but is perfect for older kids, teens & adults!! SUPPLIES & PRIZES for the FRIGHTFUL FISH GAME!